I never thought I'd be writing a race report about the time we won it on the final paddle. My love/hate relationship with water sports means I'd love to be good at them, but hate actually getting in the water. And I've been spending a lot of time in the water while paddling. Thankfully the craft provided in adventure racing are near uncapsizable and take no skill to stay in so I can focus on thrashing about with my inefficient stroke and the growing blisters on my hands. X Marathon 48 hour race was based in the charming seaside village of Marlo for 2018. It doesn't pass my threshold as a town lacking a major supermarket or, at least, an IGA. But it had the convenience of the holiday park being a one minute walk to the pub which was doubling as race HQ. After driving 5 hours from Melbourne airport the last thing I want to do is try to source dinner but the organisers Sergey and Maria are veteran racers themselves so have the foresight to include pre-race dinner as part of the entry. Being able to focus on marking the maps rather than cooking is just one of the many small things which make this event competitor friendly. The 4.30am wake up was less friendly on race day and we piled into buses for the 3 hour drive to MacKillop's Bridge on the Snowy River. It was already heating up when the gun went off at 9am and was forecast to hit high 30s later on. Not exactly what you want for an ultra endurance race. 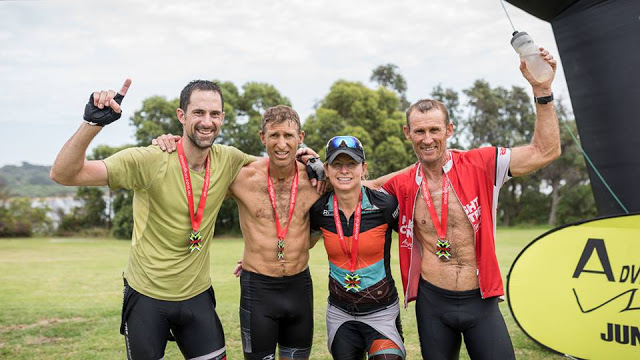 Our team, Wild Earth - Tiger Adventure saw Gary Sutherland, John Laughlin and I team up for the 3rd time with Sunshine Coast hard-man Russell Stringer completing the team. 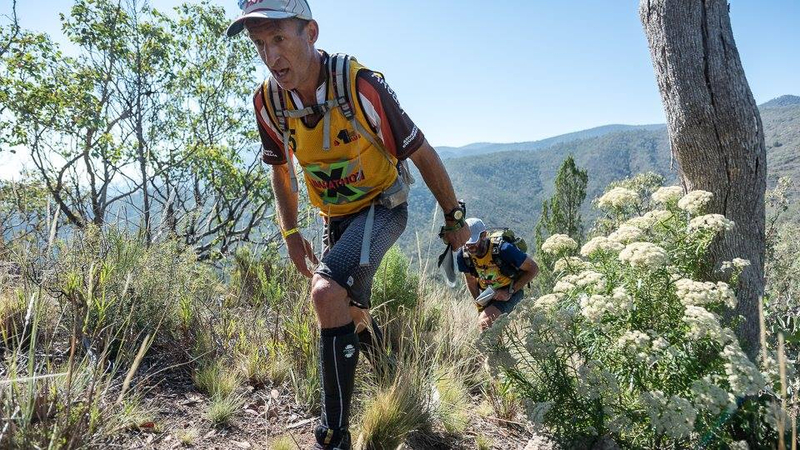 Starting with a split leg, Russ and John ran to CP1 on a nearby hill top while Gary and I pack rafted down river to the pick up point. And waited. And waited. After a few coo-ees in the bush the boys appeared after taking a longer route than planned and we'd been passed by a few teams. We were then passed by a lot more teams when our raft deflated and we spent time looking for the puncture. Hot tip: make sure the air valve cap on your raft is always done up extra tight. Reinflated, we started making up spots and enjoyed the more exciting rapids on course, with Gary and I taking just one swim in the process. Pack rafting is possibly the least comfortable thing I've ever done. I'm too short to sit in the raft without my elbows hitting the sides. While kneeling gives superior power transfer, it leaves my knee caps prone to being shattered by submerged rocks and 6 hours in that position, leaves my body screaming for mercy. Raft designers - can you please get across this and build decent seats into your products? Using our 'waterproof' dry bag as a seat only revealed it to be neither air nor water tight. Out of the rafts we quickly packed them and hiked straight up a mountain. 400 metres ascent over 800 metres horizontal in 36 degrees and my calves weren't the only things burning. It was late afternoon and we'd only complete the first leg and now had our bikes to build. The first MTB had 2400 metres of climbing in it which made my Hobart-standard 30 tooth chain ring a good choice. I hadn't drunk enough during the rafting and felt quite nauseous with a pounding headache as the sun set. Some paracetamol and ibuprofen sorted that out so I was in a better state than a lot of racers who were vomiting with heat stroke and unable to continue. Getting back on top of my fluids and a steady diet of warm, stale Vegemite and cheese sandwiches kept the sodium levels nicely balanced. Passing a couple of teams during the hike we were now in 3rd with the race favourites in front of us. The uphill riding was tough but the downhills were unbelievably dicey. Extraordinarily steep and loose I knew some less experienced riders may lose some skin or worse. It was great to have a team of guys competent on a tricky descent and my heart was in my mouth several times keeping up. There's often no single-trail in races but that doesn't mean it's not technical. We take bikes places they have no business being. More on that later. At the next transition we headed straight out on the rogaine. After suffering on the first run and bike leg, the boys sent Gary and I out to get the most distant CPs. We trotted around spotting the two other teams out on course. It was close racing but we focused on making less mistakes, keeping moving and let the race unfold. The former didn't go well as we added a degree of difficultly by forgetting the CP descriptions for this leg. Luckily most of the flags were in the places you'd expect them to be. Coming together with Explore East Gippsland during the next pack raft was a real lesson. It was one of those frustrating rivers where the water was alternately deep then too shallow to paddle meaning a lot of in and out of the raft. 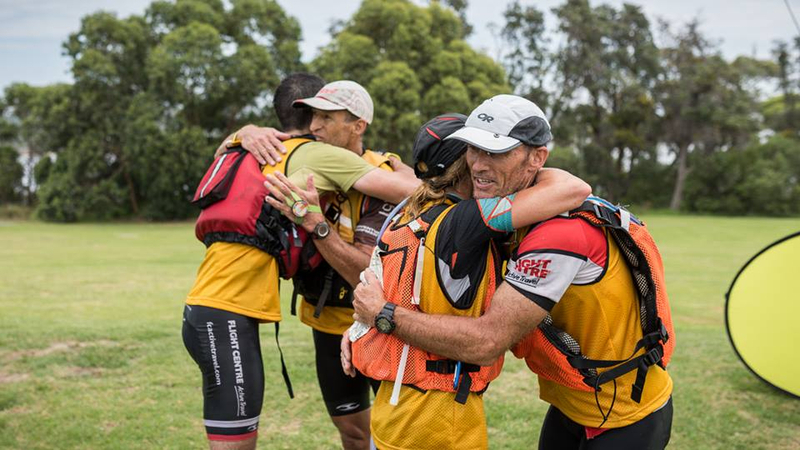 The experience of racers, like Rob and Kathryn Preston, showed as their paddle to run transition was smooth and efficient while ours was awkward by comparison. After an hour Gary and I had our routine sorted - I jumped out and grabbed the gear bag while he shouldered the raft. Except that one time I failed to hear him ask for a food break and we both kept walking, leaving the raft behind us. Communication is key. The electronic wrist bands are a welcome addition meaning all team members have to go to all check points. No more dodgy punch cards! Caving was a fun addition to the race but non-tourist caves meant a lot of sliding through small spaces would be required. This section was untimed in that it was estimated to take 20-30 minutes but we could not leave on the next leg until our mandatory 60 minute stop was up. This enabled us to relax a little and really enjoy the caves which, after the initial tight squeeze, opened up into fascinating caverns. Having to navigate both horizontally and vertically is a special skill which we discovered John possessed at our XPD race. The hardest part was finding the entrance but after that we got through quickly and had time to pack our rafts and assemble our bikes to leave right on the the end of our hour 'rest'. We had remarked on the lack of hiking in this race. Well there turned out to be plenty of hiking, it was just in bike shoes. We passed Explore Gippsland just after the start of the second mountain bike leg, collected some CPs and then hit the river crossing. One pack raft was provided by the race to transport 4 bikes and people across the river. This meant the bikes got a dry ride while the people swam across with any 'not to be wet' items thrown in the boat. This did not include my race food but the ziploc bags keep things dry 90% of the time. I was discovering that wet bread is a lot easier to eat than dry bread when one is low on saliva anyway. A short time later we started the 4km hike-a-bike section. This may have been a steep, rough walking trail 20 years ago but now it was overgrown and littered with fallen trees and rock sections. The trail would have been difficult with just a backpack, but trying to carry a bike up there was an exercise in frustration and sheer willpower with branches catching handlebars and cleats slipping on rock. We caught up to Thunderbolt after a short time and it was nice to chat and take our minds off the badness. One advantage to doing it at night is we didn't have the extra challenge of the sun beating down on us while we pushed. Four kilometers took us two hours so to say it was slow going was an understatement. Making sure the precious bikes and maps stay dry while we prepare to swim. Priorities. 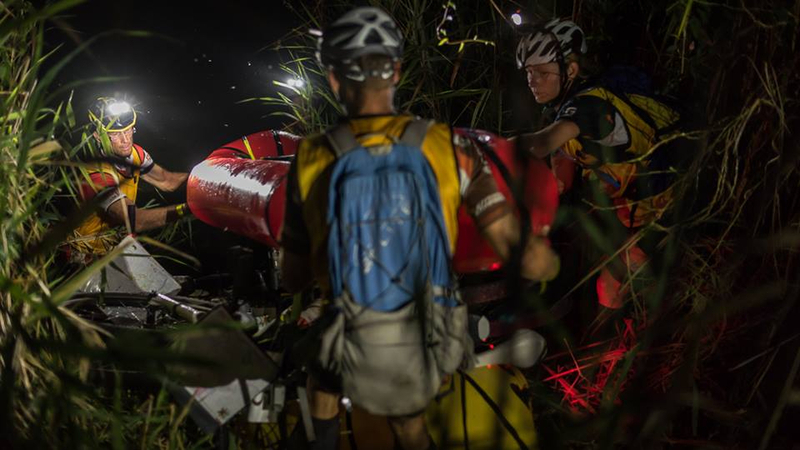 We banked on emptying the legs on the bike as we wouldn't need them on the final paddle. Pulling into transition slightly ahead of Thunderbolt I had a wave of dread. I needed to go to the bathroom. And no, not to wee. There was no way I could sit in a boat for 3 hours and hold in what urgently needed to get out. Damn all those sandwiches. I begged off to the toilet block to also fill my Camelbak and then suffered the ultimate female dilemma - no toilet paper. In a scene which took me back to my old nightclubbing days, the woman in the stall next to me had her husband run to the men's and help us both out with supplies. The sisterhood is alive and well in the country town of Orbost. Unloaded, we hit the water about 200 metres behind Thunderbolt. You know how the story ends, but here's how it unfolded. Gary basically called me soft and implied I'd given up because we are not known as a paddling team. This is because I'm fully aware that at least one half of the team (the Tasmanian half) does almost zero training for this discipline except for the odd trainer session in the garage. That was enough for us to start closing the gap, while the boys tried to hang on in our wash. Yes, being slightly pissed off is a fine motivator. Once we'd caught up, sitting in the other team's slipstream make paddling about 50% easier, like drafting does in a bike racing. 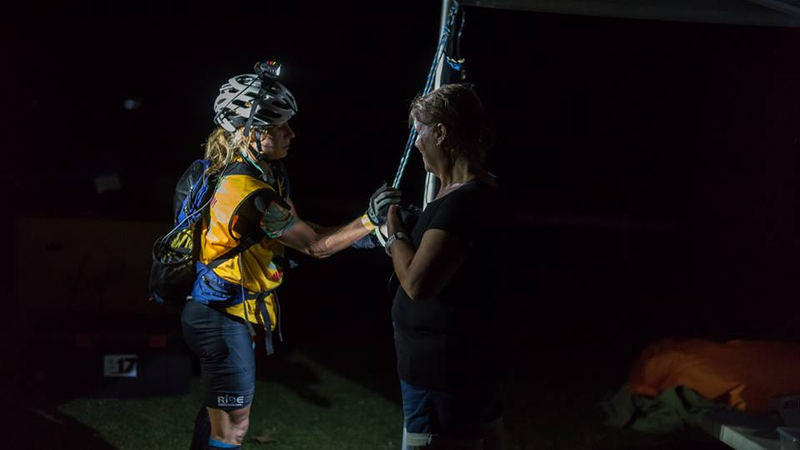 The first team to reach the checkpoint has the advantage as they create a gap while the second team punches their wrist bands into the CP sensor. Working hard to close the gap after the first water CP, we knew we couldn't keep hitting the CPs as the second team. The effort would blow us apart. The next CP involved leaving the boats, trekking across a field, on an aquaduct where we spotted the CP flag - across a disgusting, brown canal in which something may have died recently. But almost-winning makes you do crazy things so we all jumped in, swam across, back, then headed back to the boats. The final run across the field was the only chance to get a gap and we took it. I have no idea where my leg speed came from and I knew I'd pay dearly for it later but we hit the water first and turned ourselves inside out for the next 6 kilometers to the final CP on a beach at the entrance to the bay. It, of course, required a sand run, which is usually how these races end. No wonder I have such painful memories of running on the beach. We punch the CP and ran back to the boats, passing Thunderbolt still making their way to the marker. Congratulations were given as they realised we would most likely hold our lead on the short paddle to the finish line. We actually extended it as I cracked the whip, adamant that the other team wouldn't give up until we'd finished. It's not often I hear Gary tell me to slow down and take it easy on the last part of a race. After a couple of now-famous near misses last year, it was more relief than elation crossing the line in first place. It was special doing it with a great team of guys. We bicker like siblings at times, but it's because we can and still look after each other and get the job done. The course was 220 kilometers of fun and challenge, although the heat ramped up the latter. It's not often you look forward to getting wet in ARs and collecting checkpoints across waterfall pools we were almost tempted to stay in a little longer. I heard a lot of reports of people suffering from the heat. But if anyone was going to suffer it was the Tasmanians. That we not only survived but managed to win, shows that functioning in extreme temperatures is possible by having strategies in place to look after yourself. I love this sport because the conditions - both hot and cold - are treated as just another 'feature'. There's no 'hot weather rule' in AR. You just deal with it. To those who vomited their way through - I salute you. Must have abs of steel to get a spot on this team.